Complex yet refreshing with melon, delicate floral notes and subtle minerality, this wine truly expresses terroir. Enjoy this fresh crisp wine within three to five years. Pinot Gris is a versatile wine that pairs well with an assortment of dishes. It is a great wine to enjoy with appetizers including, antipasto, bruschetta, scallops, and cheese plates. The medium bodied nature of this wine also makes it great to enjoy with a meal of fresh seafood in light cream sauces or light pastas and chicken based dishes. 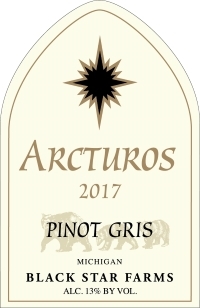 This Pinot Gris, like most of our white wines has lush fruit on both the nose and the palate. There is body in the mouth that ONLY comes from well developed fruit (meaning fully ripened and later hanging), and there is a lingering finish that simply begs for food. This wine will only get better over the next 2-3 years, but will hold well in a good cellar for 5+.